How Sticky Is Your Real Estate Website? WordPress is a great platform for a real estate website. A WordPress site has the ability to feature popular posts or recent posts in the sidebar which can keep a visitor on your site longer. Have you considered how “sticky” your site is? Being “sticky” refers to a site that engages viewers causing them to spend longer periods of time on the content and return. 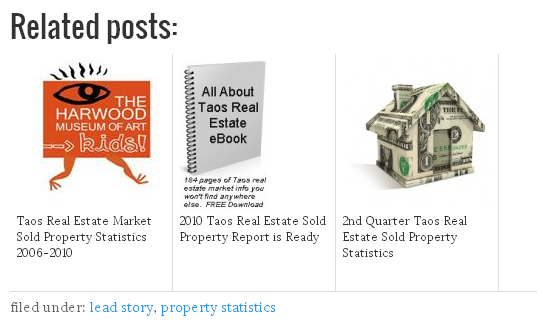 Let’s say that you have been compiling local real estate sold property or other market statistical reports for your site. Then let’s say that a visitor arrives on your site from a search on keywords associated with that content such as “yourtown real estate statistics,” or “sold property report yourtown.” Ultimately, the viewer turns up at one of your informative posts with lots of data and your market commentary. Now what? If you’ve planned ahead, you have a plugin that will display related posts specific to that post. Ideally, this will be displayed towards the bottom of your content so that it is visible just as they have finished reading. We recommend using the Related Posts Thumbnails plugin, as it uses images as well as text. We all know that images make a site more fun, engaging and most importantly, they can capture a visitors attention. Remember, we’re trying to stay “sticky”. For sorting purposes, you can setup the plugin in various ways to use either categories, tags or other criteria to determine which posts are related to the one currently being viewed. This site is set up for categories, one of those being Property Statistics. It’s also set to only pull posts with a featured image so you don’t get empty space over the descriptions. If you use analytics and watch your page views, you’ll find that once you instal and configure this plugin, people are staying on your site longer and viewing more pages.